Mattel had hoped to turn the corner and arrest its sliding sales, but inventory issues pushed its elusive recovery further into the future. 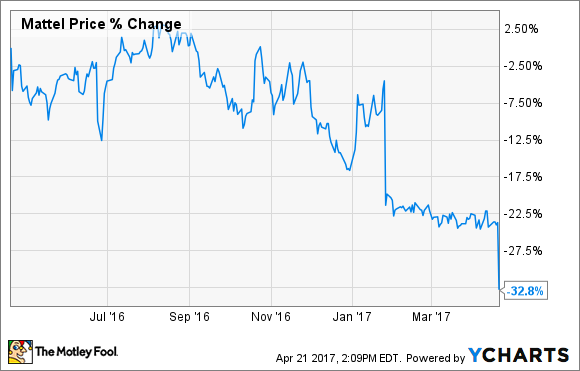 Industry-leading toymaker Mattel, Inc. (NASDAQ:MAT) has been having a tough time of it lately. Last year, the company saw full-year declines of 3%, though they were flat when adjusting for currency swings. Investors had hoped that the news would be better this quarter and that the declines seen last year had finally been arrested. Looks like investors will have to wait a little longer for the turnaround to materialize. Sales declined as retailers worked through a backlog of inventory left over from the previous quarter's weak holiday season, a process that took longer than the company had previously envisioned. Mattel noted that the weakness was limited to North America and a few markets in Europe, while seeing strong performance in the Asia-Pacific and Latin American regions. The most notable impact was on sales of the company's core brands of Barbie, Hot Wheels, and Fisher-Price, but the company believes it has worked through the backlog of inventory. "We view these results as unacceptable relative to what Mattel is capable of. ... Clearly we are disappointed with our first-quarter results and recognize we have a lot of work to do to improve execution across our portfolio," said Mattel CEO Margo Georgiadis. "As the company's new CEO, it is my responsibility to ensure we are clear about what's working and what's not working and ensure we effectively manage through these issues and set an aggressive but realistic path forward." Leftover toys weren't the only culprit. The first quarter is a seasonally slower period as parents recover from holiday toy shopping, and there is also a lighter slate of movies, which typically spur sales of related toys. Finally, realizing that this was going to be a bad quarter, the company used the opportunity to clean out some of its own obsolete inventory, which made matters even worse. Richard Dickson, Mattel's president and COO, pointed out several positive catalysts that the company believes are a sign of better times ahead. The company recently gave Barbie a much-needed makeover to expand her appeal to a larger segment of consumers. No longer limited to the buxom Barbie of old, the iconic doll now comes in several body types, adding curvy, petite, and tall options to her traditional build. She also now offers a multitude of skin tones, eye colors, and face shapes. This Barbie Fashionista line won Toy of the Year in the Doll of the Year category, an award the iconic doll has never won until now. Mattel expected a backlog of inventory this quarter to cramp its results; it just didn't anticipate the extent of the issue. The company believes it has worked through the majority of these issues and expects better things to come. Investors should keep a close eye on progress toward those goals to see if they bear fruit.